Author List. Preface. 1. Marginal Marine Halite: Sabkhas and Salinas (C.R. Handford). Fundamental Controls on Marine Halite Precipitation. Halite Crystallography and Crystal Growth. Deposition and Early Diagenesis of Marginal Marine Halite. Marginal-Marine Halite Depositional Settings - Salinas: Modern and Ancient. Marginal-Marine Halite Depositional Settings - Sabkhas: Modern and Ancient. 2. Sulphate Dominated Sea-Marginal and Platform Evaporative Settings: Sabkhas and salinas, mudflats and salterns (J.K. Warren). Sea-Marginal Sabkha Model: Arabian (Persian) Gulf Example. Other Sea-Marginal Sabkhas. Modern Sea-Marginal Salina Models. Holocene Salina Evaporites. Modern Salina Dolomite Model - Cooroong, South Australia. Brine Reflux Dolomitization. Ancient Platform Evaporites. Ancient Evaporite Basins - Depositional Models. Platform Evaporites - Depositional Setting. Sabkahs and Evaporitic Mudflats. Ancient Salterns. Comparisons of Sabkhas and Salinas. Diagenesis of Sulfate-Dominated Evaporites. Evaporite Diagenesis - the Importance of Hydrology. 3. Depositional Environments of Non-Marine Evaporites (J.P. Smoot and T.K. Lowenstein). Modern Non-Marine Evaporites. Depositional Subenvironments of Non-Marine Evaporites. Lacustrine Deposits. Fluvial Deposits. Other Deposits. Diagenesis. Distribution of Subenvironments. Recognition of Ancient Non-Marine Deposits. Economic Aspects. 4. 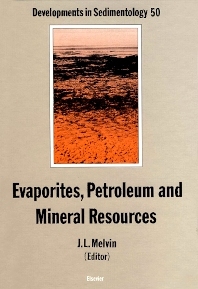 Petroleum and Evaporites (R.J. Hite and D.E. Anders). Production of Organic Matter in Evaporite Environments. The Spatiotemporal Relationships of Petroleum and Evaporites. Evaporites as Source Rocks of Petroleum. Evaporite Oils. Paleoproductivity and Preservation of Organic Matter in the Evaporite Environment. Mobile Petroleum Systems. Vitrinite Reflectance Suppression. Evaporites and Reservoirs. 5. Halokinesis, Cap Rock Developments, and Salt Dome Mineral Resources (J.R. Kyle and H.H. Posey). Geological setting of Major Salt Dome Provinces. The Mechanics of Diapirism. Cap Rock Formation. Salt Dome Mineral Resources. General Model for Diapiric Halokinesis, Cap Rock Development, and Mineralization. 6. Evaporites, Evaporitic Process and Mineral Resources (J.R. Kyle). Evaporites as Mineral Resources. Evaporites and the Origin of Ore-forming Solutions. Evaporite Alteration to Precipitate Valuable Commodities. Evaporite Solution to Create Ore-hosting Porosity. Evaporation as a Hydrologic Agent in Ore Formation. Index. This volume illustrates the expanding knowledge of evaporites as important reservoir seals, fluid aquitards, ore-hosting sediments, and economically viable sediments in their own right. Researchers, oil and gas professionals, minerals resource professionals, environmental specialists and others within geology and the other earth sciences shall utilize the information within this book in their understanding of the many recent discoveries and concepts involved in the field of evaporite sedimentology.